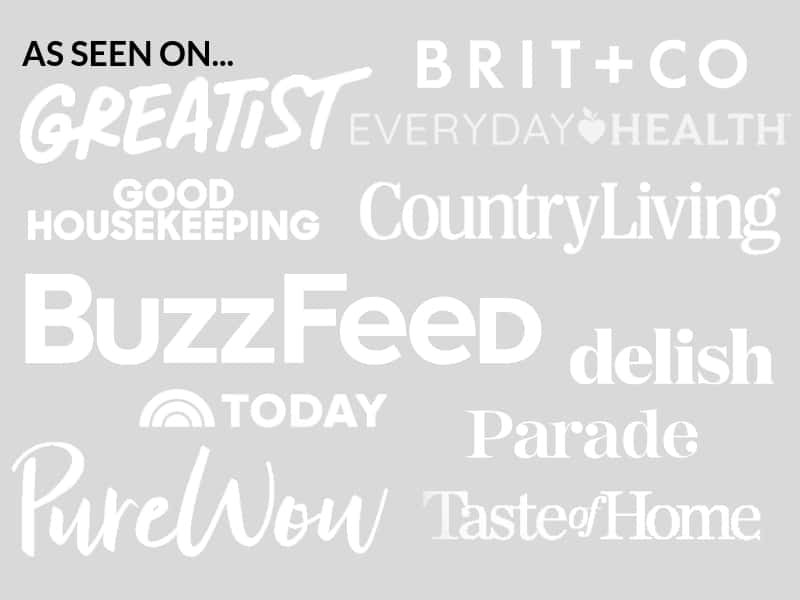 March 31, 2017 By Elizabeth Lindemann 9 Comments / This post may contain affiliate links. 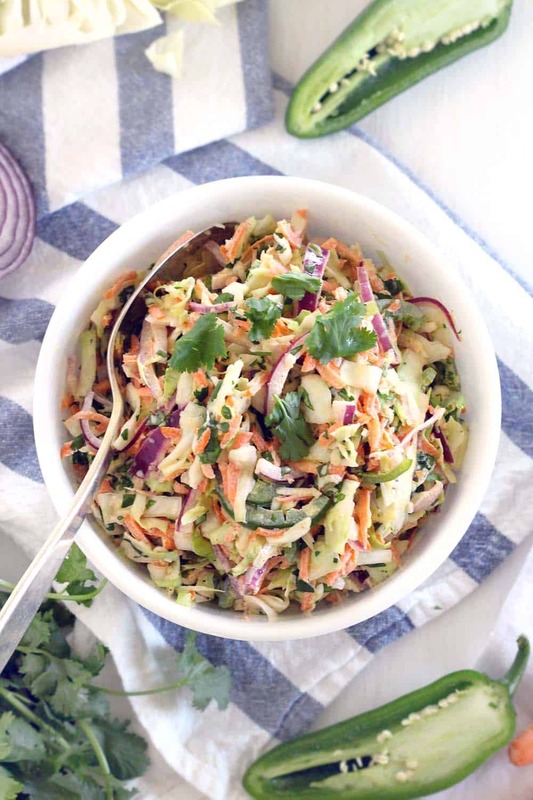 This Spicy Jalapeno Cilantro Slaw has an awesome kick and is great as a side, or on top of your favorite pulled pork sandwiches or fish tacos! It’s vegetarian (vegan optional), low-carb, and paleo/whole30 compliant (see recipe notes below). Usually, I make a mayo-free cole slaw that I call “Bar Harbor Coleslaw” (since the recipe came from a restaurant in Bar Harbor, Maine). It’s delicious, but it uses TONS of sugar. This recipe only uses 2 tablespoons of honey, which can easily be omitted for a completely sugar-free recipe. 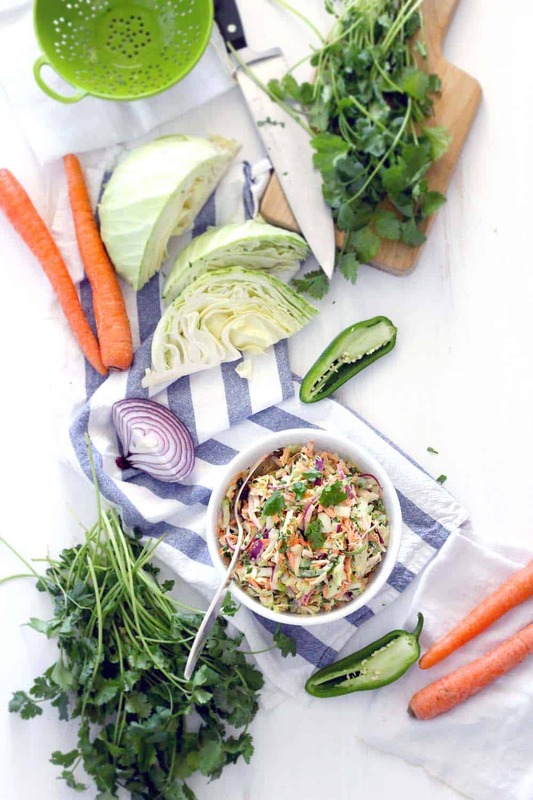 I love how colorful this cole slaw recipe is. The light green cabbage, dark green jalapeno peppers and cilantro, red onions, and orange carrots are soooo pretty together. Next time I make this, I think I’ll add some purple cabbage as well to add even more color. We had this for dinner last night on top of pulled pork sandwiches. I finally got around to using my instant pot to cook pork shoulder- I was NOT disappointed. It came out tender and juicy and fall-apart wonderful. And it only took an hour to cook! My father-in-law came over to help us plant a few trees in our yard (thanks, Harold!) and… we got kind of carried away. Why does this always happen with yard work? Zach ended up mowing the entire back yard, I ended up planting seeds in my vegetable garden… it took way longer than we thought. I just used the “keep warm” setting on the instant pot, and since I’d already made the cole slaw in advance, dinner was completely ready when we realized we were STARVING when we were done with all the work. In addition to pulled pork sandwiches, this would be excellent on top of blackened fish tacos, or on the side of oven BBQ chicken. As the weather gets warmer and warmer, this is the perfect thing to make next time you grill out, or to take to a potluck or picnic, since it’s easy to make ahead of time! I used the slicer blade and grating blade attachments on my food processor to cut the cabbage and carrots very quickly. If you don’t have a high quality food processor with attachments like these, they can be a lifesaver when you need to chop a bunch of things. I have this Cuisinart food processor, and I love it! 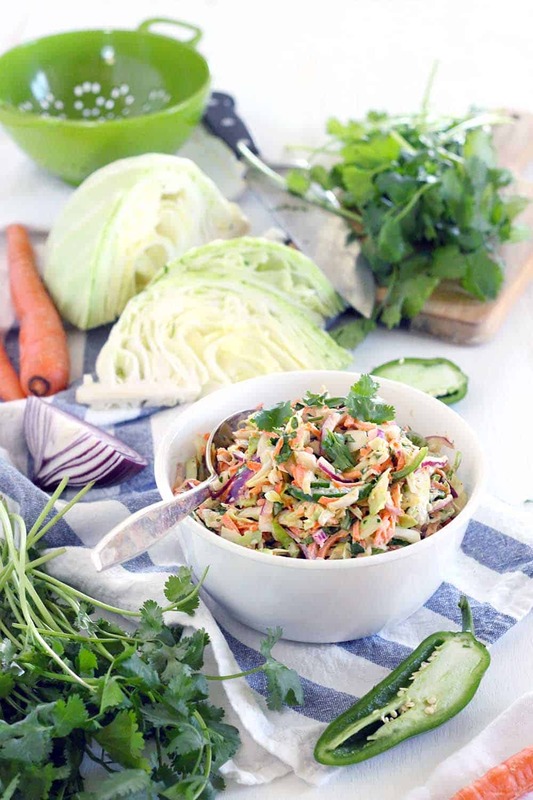 This easy, delicious recipe for Spicy Jalapeno Cilantro Slaw is great as a side, or on top of your favorite pulled pork sandwiches or fish tacos! Vegetarian, vegan optional, low carb, and paleo compliant. 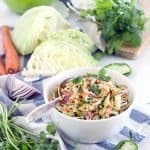 In a large bowl, mix all cole slaw ingredients (you can make easy work of the prep by using an attachment on your food processor for cutting the cabbage and carrots). Serve immediately or after refrigerating for up to two days. Serving suggestion: on top of pulled pork sandwiches or fish tacos, or on the side of oven BBQ chicken. For a vegan version, use your favorite vegan mayonnaise and substitute the honey with agave or sugar. For a whole30 compliant version, omit the honey (and make sure to use homemade or compliant mayonnaise for both paleo and whole30 versions). I love spicy food and this slaw had a great kick. If you’re bringing this to a pot luck or you’re so-so with spicy food, scale back the jalapeños to just one. Glad you liked it, and thanks for the suggestions! This sounds amazing! 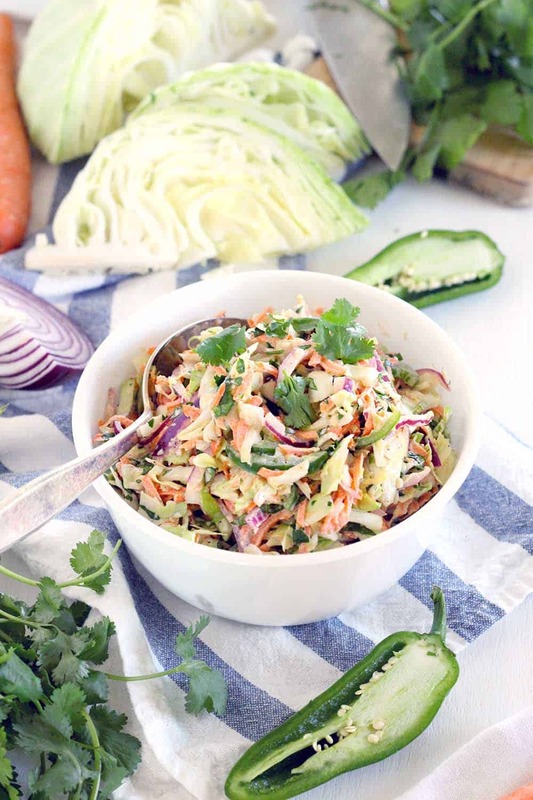 One question for you…if I were to buy the bagged already shredded slaw with carrots and such in it what size bag and how many would equal this recipe? Hm, good question! I’d say you probably want about 4-6 cups total of the coleslaw mixture. Hope that helps! I just want to let you know how much I LOVE this slaw! It has been a hit at every BBQ I’ve attended so far this summer. I’m taking it to a work potluck tomorrow and serving it at a 4th of July party this weekend! I’m on Weight Watchers and I love that with light mayo this is super point friendly. Thank you so much for sharing! Thank you so much for the nice comment- I’m SO glad you like it! You could leave out mayo and make a vinegar based “sauce”. So much healthier! I also shred either bell peppers or poblano peppers into mine. I’m from Austin too. Born and raised. 17 years ago I married and moved to PA. Have y’all ever been to The Catfish Parlor? I replicate my coleslaw to theirs! I miss fried catfish! Can get any up here…most people think they aren’t real. HA!